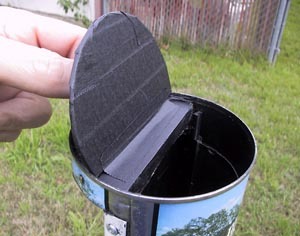 Pinhole camera made from a coffee can. When I visited Kurt’s Mottweiler’s site and looked at some of the photographs people have taken with his cameras, I was overwhelmed by their quality and possessed with the desire to take similar photographs. My only problem was a lack of funds. Kurt’s Pinoramic camera is rather expensive--worth every penny I’m sure, but out of my price range. If I have a sudden influx of cash, I’ll buy one in a minute, but I wanted something I could work with immediately. So I began trying to figure out what I could make . 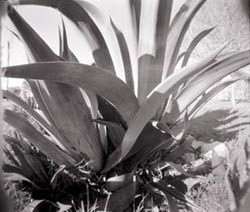 The first thing you will note about Kurt’s camera is its curved film plane--this cuts down on distortion and provides the same “focal length” throughout the horizontal plane of the image. I definitely wanted the curved film plane, but I didn’t think I could fabricate a mechanism that would handle roll film--frankly, I’m more of a mechanic than a craftsman--so I decided I would go with sheet film. I began looking for something curved, and under the sink I found an old coffee can. It looked about right. 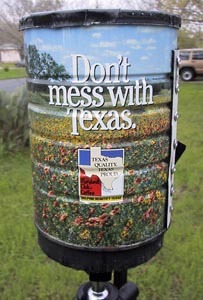 When I tore the paper off the can, I discovered a scene of wildflowers and a “Don’t mess with Texas” anti-litter advertisement. Perfect! I got my Dremel tool and cut the can apart. I might have been able to use a saw, but figured it would deform the can, which I was trying to avoid. I left the top intact so I could get a light-tight seal. Instead of cutting it exactly in half, I left a little extra (maybe 200 degrees of the arc, instead of 180). I painted the inside of the can flat black. Then I needed something to hold the film. I thought about this for the better part of a day before I remembered that I had some old leaky 4x5 film holders up in the attic. I dug one out and disassembled it. Inside were two aluminum rails and two formed aluminum sheets that back the film. I decided I could use the rails and bend one of the sheets of aluminum (since it was already exactly the right size) to form the film plane. The rails were set upright in the can, so I could use them to guide the film in, but I turned the sheet of aluminum sideways to give the camera a horizontal format. I glued all three pieces in place with epoxy. Unfortunately, I didn’t start taking photographs until I had already glued these pieces in place, so they are a bit hard to see clearly in the photos. I’ve since found that I can use the “bar” from a sliding bar report cover--a u-shaped piece of plastic used to keep the cover on a report--with a little modification. Initially, I had intended to use roof flashing tin (actually steel) to make the front of the camera, but when I went to borrow my father’s tin snips, he offered me some aluminum that is also used for roof flashing. It was lighter and much easier to work with, so I accepted it gratefully. It turned out to be perfect for the purpose. I cut and bent it to fit. Instead of painting the inside flat black, I covered it with black photographic tape (Scotch 235). I had wanted to paint it, but was unable to quickly locate the zinc primer that would enable the paint to stick to the aluminum. With my coping saw I cut two semi-circular pieces of wood, one to go in the top to give it some rigidity (and help with the light-tight seal), and the other to go on the bottom so I could attach a tripod mount. The bottom piece was essential if I wanted to be able to use the camera with a tripod. I painted both these pieces of wood flat black and attached them to the coffee can with small brass wood screws. I drilled holes in the flanges of the aluminum front, then mounted it on the can and drilled similar holes in the can. Utilizing copious quantities of black silicone adhesive sealant on the top, bottom and sides, I attached the front piece to the body of the can and riveted it down both sides with aluminum pop rivets. I let the assembled camera dry overnight. I checked it for light leaks and couldn’t find any. Using a piece of a mat-board cut-out, I made a semi-circular flap to seal the top, covered it with black photographic tape, and taped it to the piece of wood in the top of the can (I had set the piece of wood about 1/8 inch down from the top rim of the can so I would have room for this flap). Then I covered the plastic lid of the coffee can with black duct tape. You can buy a whole set of precision drilled pinholes from the Pinhole Resource for only $44. 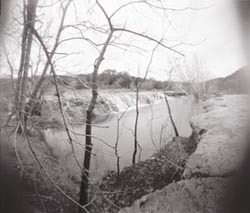 They also carry an array of ready-made pinhole cameras and offer a great deal of information about pinhole photography. 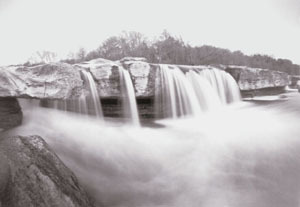 The Unblinking Eye Eclectic Links page has links to several other interesting and informative pinhole sites. 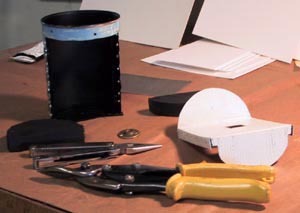 How to make a pinhole. 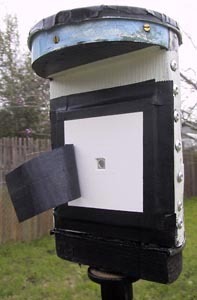 How to make a pinhole exposure calculator (for reciprocity failure compensation). Large format pinhole cameras for sale. 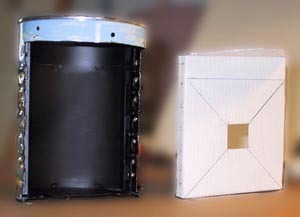 Large and medium format pinhole cameras for sale.